← Quick Technique: Poppin Pastels on Ribbon? I only have 15 minutes to post tonight so here are a few of my favorite swaps from our April Get Together here in Florida. All stamps, inks,papers and accessories are from Stampin’ Up and you can see the current products here! Stamped by Sandy Fechtenburg. All Images copyright Stampin' Up! 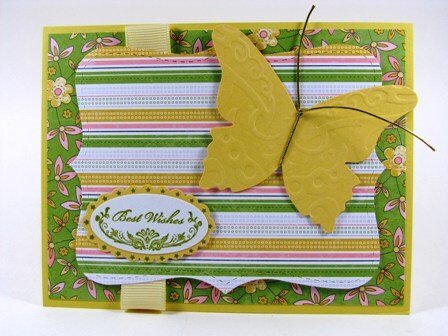 Sandy used the Tea Party dsp with a Sizzix butterfly cut out of So Saffron. The butterfly has been run through the Texturz Plates. Stamped by Patty Sharkey. All Images copyright Stampin' Up! Patty wheeled the Lazy Days wheel from the Occasions mini down the side of the card – in Tango maybe? or Only Orange? 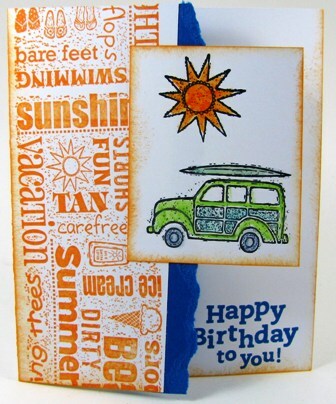 The stamp set is Just Beachy, also from the Occasions Mini catalog. Stamped by Kathy Yip. All Images copyright Stampin' Up! 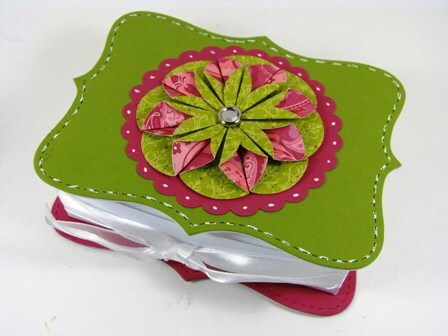 Gorgeous box using our Top Note Sizzix die! She used our white gel pen to highlight the stitching already on the Top Note. Stamped by Karen . All Images copyright Stampin' Up! 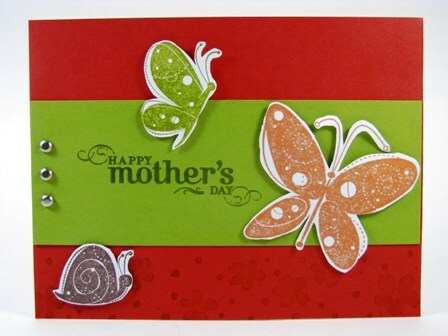 Karen said she adapted this design from the SU Stampin’ Success in May, page 11. The base of the card is Real Red and she embossed the greeting, too! Stamped by Jackie Walker. All Images copyright Stampin' Up! Jackie used Cameo coral as the base of the card, added some Pink Flamingo paper and the Just Beachy stamp set. Cute! Stamped by Cyndra Alderman. All Images copyright Stampin' Up! Cyndra used a little puffy paint or liquid applique (we don’t sell it anymore but you can get it at the craft stores) for the cupcake icing. I like how each cupcake has a different color liner! 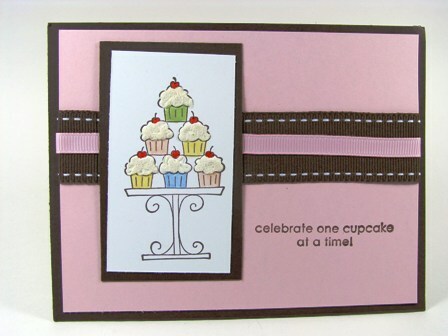 Crazy for Cupcakes is the stamp set name. This entry was posted in Swaps & Inspiration and tagged rubber stamping techniques, Stampin' Up!, tutorials. Bookmark the permalink.